College, the best time of your life as they say. Notorious for an insane amount of debt, little sleep and a few regrets. Aside from all of the craziness of college, there are quite a few perks of being a student. As a current student I have found quite a few ways to save a buck in the photographic and creative realm, as well as a few other places. 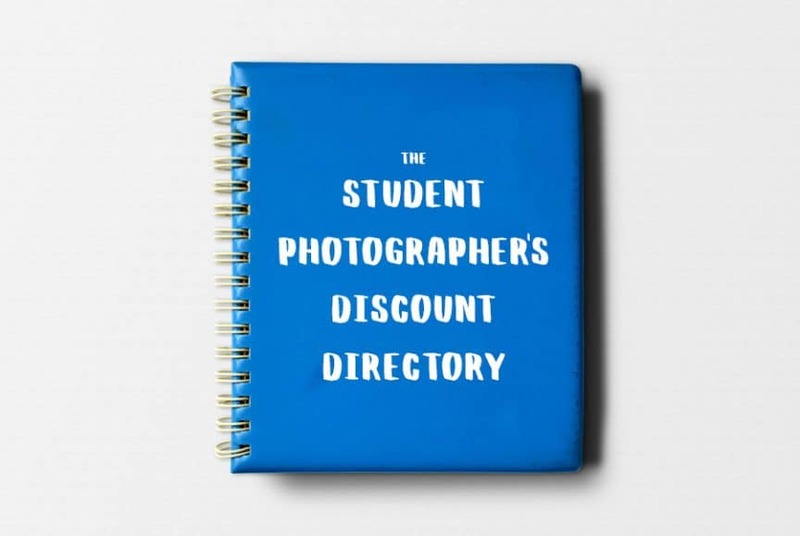 This directory serves as a perpetually updating detailed list of companies, brands and services that offer deals and discounts for students. As long as you are an enrolled student and have a legitimate school email ([email protected]) you should have no trouble registering for an Adobe CC account, at a sweet discount. As students there are two options to choose from. The first option is the Creative Cloud Photography Plan, Student and Teacher Edition which comes in at $7.99 USD a month. This plan includes Lightroom and Photoshop and is a great and cheap option if you are a just a photographer, or just getting your feet wet with photography. I used the Photography Plan for my first two years at school. I recently began teaching myself graphic design and upgraded to the full Adobe CC Suite. Lucky for students, we can get the entire Adobe CC Suite for just $19.99 USD a month with the Creative Cloud Student and Teacher Edition. The entire suite includes, Lightroom, Photoshop, Illustrator, InDesign, Premiere, After Effects, and more! This plan also includes access to all of the CC apps for mobile! Find more info about Adobe Student here! If you have not heard of B&H, let me enlighten you. B&H Photo-Video-Audio is a camera store in New York City and an online retail giant for camera sales. I really like this company, all of the people are very helpful and all orders over $49 USD get free shipping! I stumbled across B&H's student discount by accident a few months back, and later used it to my advantage! You must be a U.S.A. based educator or student in an accredited photography, film, video, animation, graphic design, audio, new media at a collegiate-level institution (High School Educators of approved programs are also eligible). A copy of your current and valid school issued ID. A copy of your current curriculum, class schedule or transcript. Remember, the EDU Advantage only applies to certain items. However, I used the EDU Advantage recently and purchased a brand new Canon-mount Sigma 50mm f/1.4 Art lens for about $850.00 USD, which is $100.00 USD off! Find out more and register for B&H's EDU Advantage here. Lynda, Lynda, Lynda. I cannot say enough good things about this website. Lynda is an online learning service with thousands of courses included within one's membership. You can learn almost anything from photography and graphic design to business and marketing. I am currently taking courses on Adobe Illustrator, Photoshop, and InDesign. I got a free membership (typically $25.00 – $37.50 USD a month) through one of my courses in my department at Colorado State University (Journalism & Media Communication). In order to get a free account your university or college needs to set up a school-wide or department-wide account for students. Check in with your department to see if your student fees include a free student membership on Lynda. Lynda accounts can also be set up by business for employees to learn skills, you can also check with your employer. What's great about Lynda.com is that it is run my LinkedIn. When you complete a full course, you will get an official Lynda.com certificate on your LinkedIn profile! Learn more or start your free trial on Lynda.com here. DJI is the leading manufacture in consumer drones today. With just your student email, you can make an account with DJI, where they offer unique discounts for students. Sign up is super easy. Click the link below, enter you email and verify. Coupon code will be available within your account. After singing up, DJI gave me 2 one-time-use codes each at 10% off. These codes are tied to your email, so don't think about sharing with your friends. Honesty is the best policy. Learn more about DJI Edu here. Apple has always been good about students getting access to Apple products for school. They do offer discounts for students, but only on computing devices likes Macs and iPads. Unfortunately, from a big company like Apple, the discounts are not as generous as others. We can't complain though, as a discount is a discount. Discounts tend to be higher on iPad Pros then MacBooks. *After getting my Student ID for Colorado State during my senior year of high school, I purchased my current MacBook Pro (2015) from the Student Tech Shop and received a discount before my classes even started that fall. This is a great way to get a great device to edit photos on, as well as study. Find out more about Apple's Student Pricing here. Grant Whitty is a Journalism and Media Communication student at Colorado State University in Fort Collins, Colorado. He began his photographic endeavors in the eighth grade and now specializes in wedding, freeski, and adventure photography. Find Grant on Instagram at @grantwhitty (skiing + outdoors) and @grantwhittyphoto (weddings + engagements).